Teaching English Abroad... and The Most Embarrassing Experience Ever | Where in the World is Nina? I took my seat on stage with about ten other teachers, traditional Thai music playing in the background, and about 1,000 pairs of eyes glued to me. One second later the entire room erupted in gasps and screams. Students held their hands to their mouth, teachers had their arms flailing in the air, and others were half covering their eyes as if they were watching a horror movie! The teacher sat next to me push my leg down and the ceremony continued. What. Just. Happened?! I had no idea. Today was Teacher’s Day. The students did a bit of a ceremonial honoring in front of each teacher with the extraordinary flower arrangements they spent the whole week making. 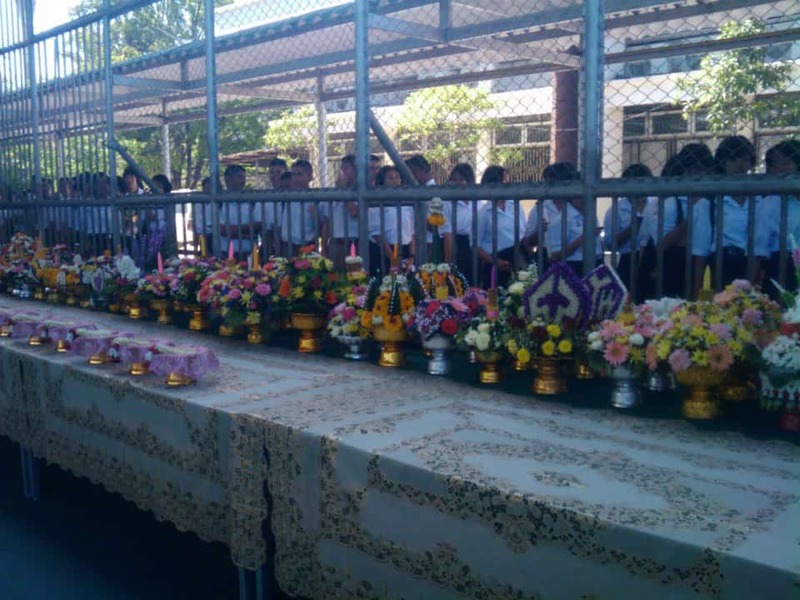 They handed each teacher a flower arrangement and did their wai at the end out of respect. But why the gaps and screams when I sat down? I still didn’t understand. As my group of teachers left the stage, the teacher who pushed my leg down, a teacher who I adored, told me what I had done wrong – I had crossed my legs. Coming from the US, crossing your legs is a ladylike thing to do, especially when in a skirt. However, in Thailand, while on stage no less, it’s a huge no-no! Despite reading cultural etiquette in Thailand prior to coming over, I was hardly into my first month of teaching and didn’t understand the extent of feet being an unholy part of the body and not to point it at anyone. I didn’t categorize crossing my legs while in a skirt as a no-no as I didn’t see it as pointing my foot! For the record, you’re supposed to cross your ankles and tuck your feet under your chair. Your feet will be facing back and your knees are kept parallel to each other, not one on top of the other. This is a story I look back on and feel embarrassed about, but can’t help but laugh. My school in Ayutthaya, Thailand took me in as a teacher and gave me memories to last the rest of my life, yes, the embarrassing ones too. I took the plunge to teach abroad in May 2011, and it’s what started off my life of perpetual travel that I’m still living today. I’m forever grateful for my experience teaching English, and urge anyone seriously thinking about it – to do it. Not sure what it takes? What does it take to be an English teacher abroad? To be understanding and to have a ‘go with the flow’ attitude. A person who is flexible. Physical flexibility is not a requirement unless you’re teaching the youngsters, that is… I’m talking about personality wise. Well, the degree and being a native English speaker “rule” can be somewhat bent. I’ve definitely met teachers who weren’t native speakers, didn’t have a degree, and some weren’t certified. HOWEVER, finding a job and finding a job that actually pays will be a bit harder. It all depends on where you teach! Some countries might even require you to have an actual English degree and years of experience. Is teaching English abroad really for me? If you’re not open-minded, flexible, and understanding of the different ways and approach that might be taken, teaching English abroad might not be for you. It’s probably not going to be run like a school back home. Just know that each place will their own rules and ways and it would be best to come ready to take on whatever is thrown at you. So where can I actually obtain a job teaching English abroad? Pretty much any country in the world that doesn’t speak English as their native language! Pretty cool, huh? That opens up a lot of doors! Asia is a super popular place for people to get teaching jobs abroad because many of them either pay well or are very cheap to live in. For me, it was the latter. I didn’t make much teaching English in Thailand, only about $1000 USD a month but I often didn’t spend over $500 a month. It will certainly depend on the school but some will provide you with curriculum and some will expect you to make it up. Some will leave everything totally up to you! For me, I had total free reign which was awesome and challenging at the same time. Long story short, making up fun English games it what worked best for me and my students. You can read more about my experience teaching English in Thailand to see what it was like. So do you think teaching English abroad is something you’d like to try? Where would you consider teaching English? I am a non native English speaker but plan to do certifications as required. My question is how important or necessary it is to learn the language of your students? Is it mandatory to learn the other language and if not then how to teach without knowing how to translate? It’s not! Sometimes a local teacher is in the room to help, or the students have a basic level, some school don’t want you to use the native language at all. It’s rare you’ll find a place that requires you to know the local language. Hi, Nina! I’ve been teaching in a rural school in India for the last 3 weeks. As you implied in your “FAQ Teaching English in Thailand” article, it’s been really challenging to get the kids to speak English sentences, especially since the regular teacher teaches in Hindi. You said that you used games to engage the students. Could you give a couple examples of what types of games, or other methods that got the kids to speak? Hey! Oh gosh, the games weren’t easy to pull off in the beginning because my classes were SO large. I’m talking about 40-60 kids per class and only once a week. Uh!! ANYTHING competitive worked. They LOVED the competition and they felt more confident in groups. I found it worked best to make a game, less pressure. I made ALL of my games up bc everything I found online was too hard for them or was better for small groups. So I painstakingly created a new game each week. Sometimes I had them race up to the board to finish a sentence or find a mistake. I Once made a calendar game to practice “who, when, and where.” I would ask “Where is John going on the 12th?” And the first team to correctly find where John was going on the calendar got a point. Where u a teacher in the states? Would it be hard to do school nursing jobs? You’ve really helped a lot with info! No I wasn’t and I don’t know anything about nursing, sorry.